Nuribel white halter neck formal evening dress. 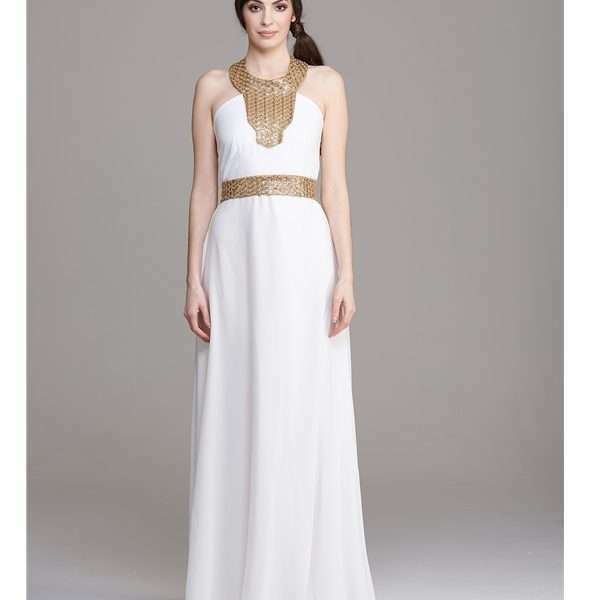 features gold statement neckline and waist detailing. Front split on an a-line shaped chiffon skirt. Nuribel white halter neck formal evening dress. Stunning full-length evening gown in white with gold feature neck and waistline. Head-turning formal dress with gold, Egyptian-style statement neckline; featuring a beautiful gold halter-neck, with floor skimming chiffon a-line skirt and daring full-length split. This gorgeous dress is a perfect choice for your next debs, formal or black tie event. Blush Boutique offer the Andalusian design house Nuribel as one of our occasion wear collections. Nuribel design, produce and distribute clothing for the elegant and modern woman and fits perfectly among our own brand ethos. Founded by Francisco Paque in 1987 this successful fashion house has customers throughout Europe. Nuribel design fashion for women of all ages, characterized by the fusion of vanguard and tradition, between contemporary fantasy and classic romanticism. The European influence can be seen and felt in the quality and style of their designs, providing our customers with an occasion wear outfit that is special and unique.